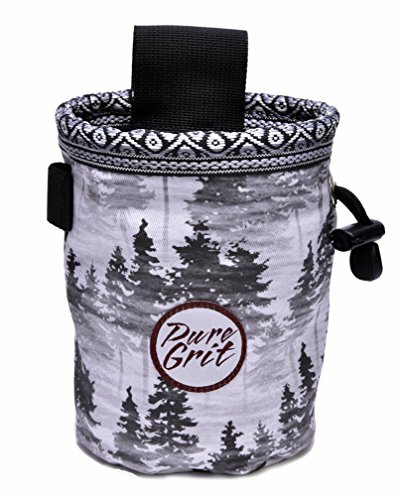 Hand-crafted & USA made, Pure Grit's brings a fresh and stylish option to chalk bags. Fashion driven with unique textured and printed fabrics inside and out, pick your favorite and bring some personality to the crag. Functional and high-quality finish, it's a great addition to your climbing gear. Unique fabric that are backed for durability and resist tearing. Smooth sliding synch cord lock closure that shuts 100% Dimensions: 5.5" tall x 4.25" diameter 50" adjustable and removable comfy 5/8" waist strap Fleece chalk compartment. Elastic brush holder on side of every bag. If you have any questions about this product by Pure Grit, contact us by completing and submitting the form below. If you are looking for a specif part number, please include it with your message.